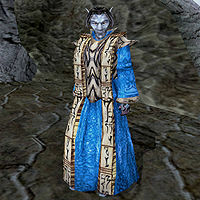 Marin Thelaro is a Dunmer noble and Hireling in House Telvanni who lives in Gah Sadrith. Oddly, he acts as a Guild Guide even though he isn't a member of the Mages Guild, and will transport you to the docks in Port Telvannis for a fee. This page was last modified on 6 March 2019, at 08:06.